We study the security of hash-then-publish time-stamping schemes and concentrate on the tightness of security reductions from the collision-resistance of the underlying hash functions. 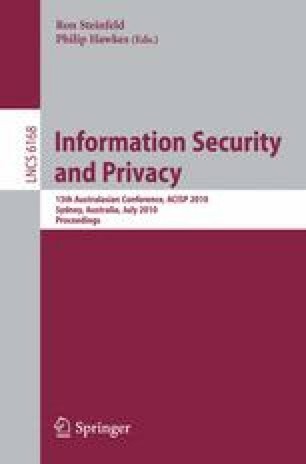 While the previous security reductions create a quadratic loss in the security in terms of time-success ratio of the adversary being protected against, this paper achieves a notably smaller loss of power 1.5. This is significant for two reasons. Firstly, the reduction is asymptotically optimally tight, as the lower bound of 1.5 on the power was proven recently by the authors in ACISP 2009 and this is the first application for which optimality in this sense can be demonstrated. Secondly, the new reduction is the first one efficient enough to allow meaningful security guarantees to be given for a global-scale time-stamping service based on 256 bit hash functions, which considerably increases the efficiency of possible practical solutions.